The game doesn’t look like much, but it’s down right tough. After a brief experience with Greywater, my friend and I moved onto the game that I sunk the most time into – Gun Mage. It was a side-scrolling action game inspired by the likes of Contra and Metal Slug. The graphics were simple, but the gameplay reeked of its influences. It seemed pretty basic until I died enough times that Cameron Fowler, one of Gun Mage’s designers, clued me in on a cheat of sorts. Pressing the page up button filled the magic meter, which allowed me to combine a magical effect with a weapon. With about a dozen combinations, I had a blast experimenting with them and seeing their outcomes. Even though Gun Mage only had nine screens, I spent a good twenty minutes to get through them all. I think I might’ve been the only person to do so at the show. Managing the stock of hearts I had well meant seriously paying attention to the two enemy types. 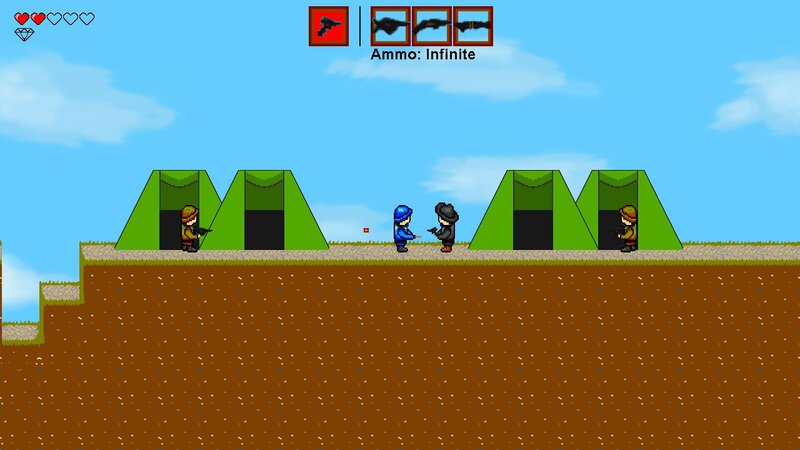 Blue enemies appeared to have knives, only doing damage on contact, and beige enemies who were equipped with guns. Staying alive meant jumping over the bullets of gun wielding enemies and finding a weapon/magic combination that suited me. The demo is available to play via the Dropbox link and through its Facebook page. Don’t forget about the page up button!